Over two thousand years ago, cosmopolitan groups of sailors and traders from Mediterranean and North African coasts, would disembark in a small cove dominated by the Castle, probably close to the Cruise Terminal, in order to exchange their manufactured products with unprocessed but equally important materials. 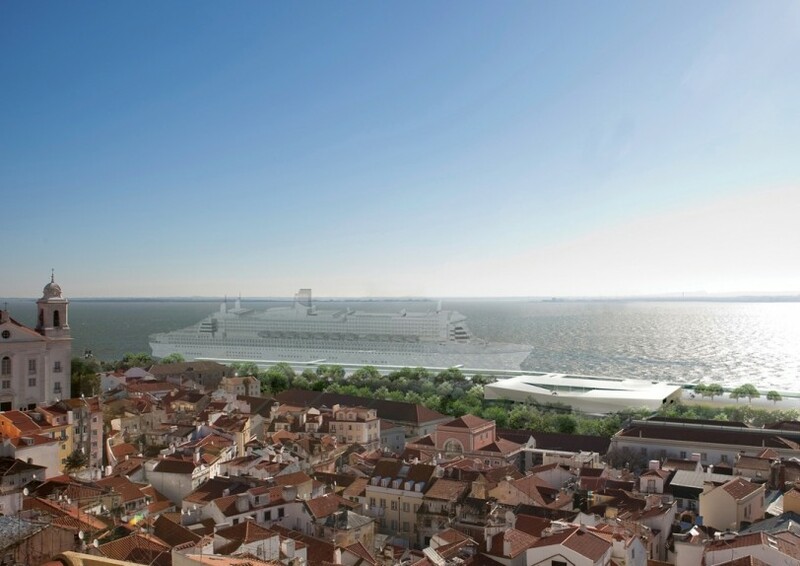 Entering the narrow base level of the Tagus would happen after days of maritime journey, stopping in several exchange depots during the cabotage through the South and South-Eastern Iberian coast. The amenity, the succession of prominent hills, the ‘Mar da Palha’ – an expansion of the river in the shape of an interior ‘sea’ at the end of the estuarine strait, must have bestowed a striking arrival. 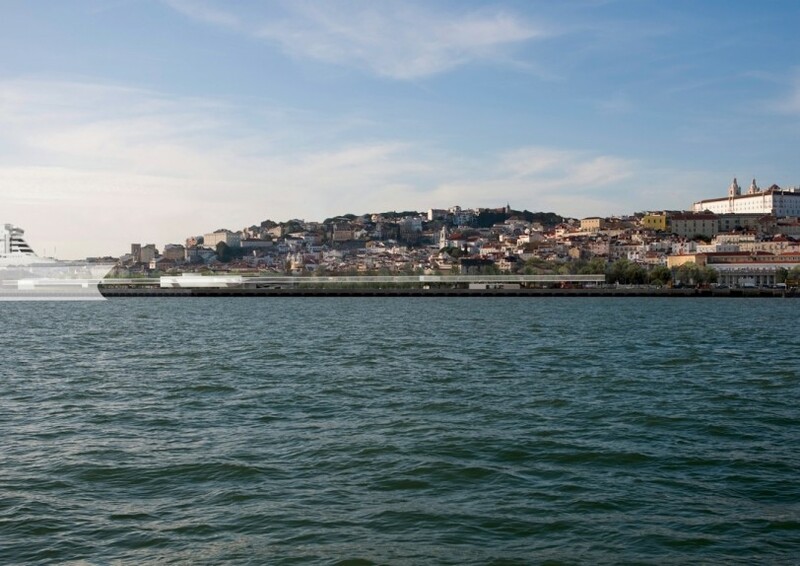 Today, and each morning, entering the Tagus shoal is an unforgettable experience, as great cruise ships sail through the Bugio lighthouse and are suddenly surprised by the landscape of the city of Lisbon, awaking under a sweet and hazy light, revealed by the sunrise lit mist. The slow manoeuvring and mooring of the vessel invites the beholding of the city, fitted within its hills, the Alfama neighbourhood, its churches and the Castle. 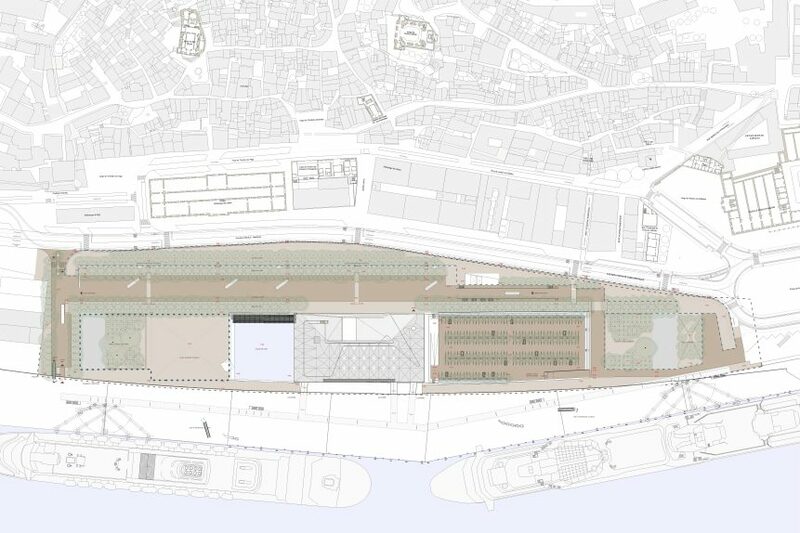 The immediate panorama of the port cranes and the pathways is mediated by the extensive tree lanes, forming the riverside Jardim do Tabaco Park, on the bank of Alfama. As one exits the terminal a generous square opens up, defined by the quasi-dihedral formed by the Terminal and the former Customs building, revealing a frantic entanglement of people, taxis and buses, and the hectic movement of people from and to the Stª Apolónia Railway Station. 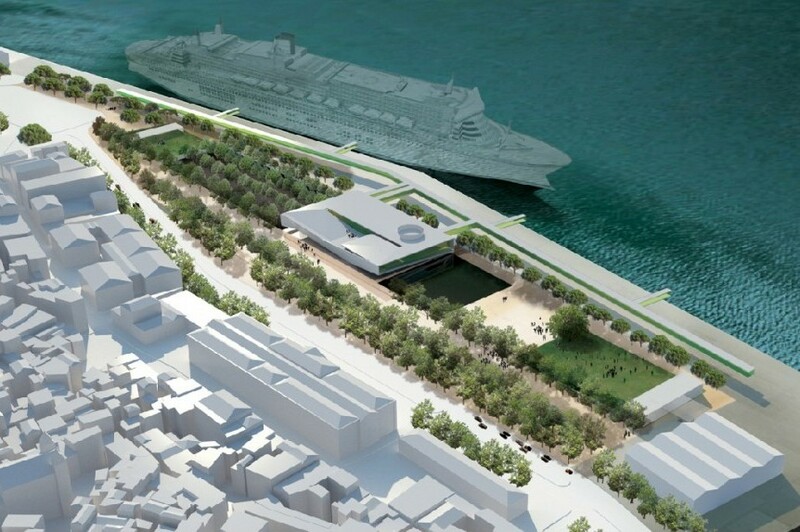 After the initial bustling from passengers getting on tour buses, the golden hued pavement is then visible, and so is the view of the Alfama slope and the great water surface in the Square of Jardim do Tabaco, reflecting the silhouette of the Cruise Terminal and the moored ships. Crossing the large avenue the dense limit of the mediaeval city stands before us, with its alleys, gates and small squares, and passing by the Fado Museum, begins the journey in the enigmatic neighbourhood of Alfama. The Belvedere of Portas do Sol and Stª Luzia arise as an inevitable place to halt, breath and contemplate, on the upward way towards the Castle. S. Vicente, Stª Engrácia and Alfama can all be seen, and from here the Tagus appears extensive and luminous, the south bank looks distant. The ship we arrived in is ‘leaning’ against the dock, and the dense foliage of Jardim do Tabaco is visible, so is the Terminal’s wooden roof and the adjacent water surface that evokes the former Jardim do Tabaco Dock. 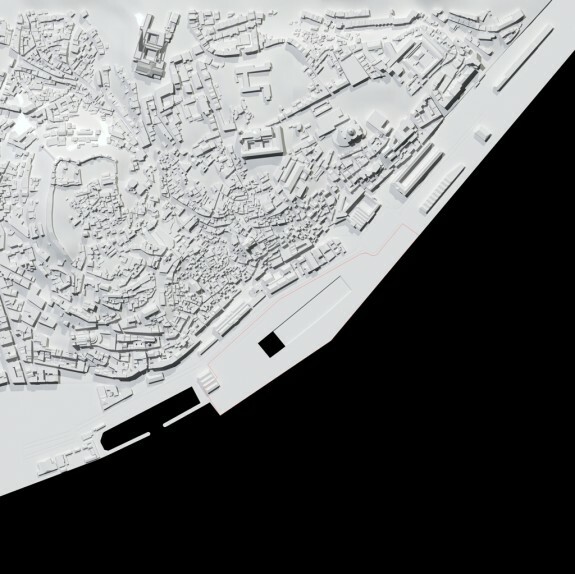 It is visible the transformation the Alfama bank has undergone: the Dock is still noticeable in its white stone contour and the Terminal building is fitted in the discernible gap, the level parking, and the large water surface that refocuses the new Square of Jardim do Tabaco with the entrance to Lisbon that we discovered earlier. It is now apparent the Park Jardim do Tabaco, constituted by the lanes of Narrowleaf Ashes, the alignments of Mediterranean Hackberry along the avenue, and the marginal Umbrella Pines whose unmistakable silhouette is projected against the ships’ hulls or the river snippets in between them. The smooth and natural light spread by dusk on the estuary, contrasts with the Terminal’s artificially lit wooden roof. It is time to go down Alfama and spend some time in this terrace overlooking the river, now relieved by the ships that left with long farewell horn sounds. The city remains for those who have not embarked. In the squares of Alfama, in its gates, alleys and steps, doors and terraces open up uncovering the free and southern street life. Having lunch or dinner, merely wandering or walking back home. The square Terreiro do Trigo, with its fountain Chafariz d’El-Rei (where segregated spouts were assigned to African, Mulatto and Indian; moors from the galleys; white boys and men) is now the location for the street market, where flowers, fish and aromatic herbs are sold, daily arising and retracting from the nearby warehouses. The pavement in the Alfama slope is black and white, basalt and limestone, ‘draining’ till it meets the avenue with its limestone kerbs. The Jardim do Tabaco reflects the light in the pavement’s golden hue. The bitumen aggregated golden river pebbles create a surface that is as extensive as it is limitless. As we approach the Jardim do Tabaco Dock and Terminal we cross the infinite fresh lanes of Narrowleaf Ashes and Mediterranean Hackberrys (occasionally occupied by buses and taxis), with their long benches and white stone drinking fountains. As white as the stone that coats the former Jardim do Tabaco Dock. The Terminal, in the latter embedded, has the large water surface on one side, reminding us of the former Dock, and the black basalt surface on the other, where barely visible cars park in-between the Willows. In this extensive elongated shape we have the Square of Jardim do Tabaco’s pavement, with the same clear and sandy material, the appealing pavilions of restaurants and bars bounded by the grass surfaces in the east and west. The Jardim do Tabaco, evocative of remote trade, is now part of the new Lisbon life, as it rediscovers the Tagus riverside.